Get creative with Adobe Photoshop. Step into the world of visual design with General Assembly. During our introductory workshop, explore the tools and techniques you can use to bring websites, marketing materials, and more to life, and see how designers make their mark on the digital world. 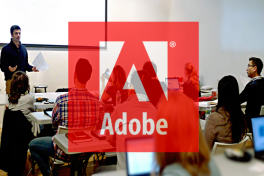 Working through a series of guided demos, youll: Learn the fundamentals of Adobe Photoshop, a go-to tool for digital designers. Touch on essential design principles including composition, color theory, and typography. Survey todays digital design landscape and its career opportunities. Step into the shoes of a UX/UI designer, learn more about what they do, and execute a creative brief. Chart your own career path Pick up where this workshop leaves off. Enhance your professional skill set in our part-time Visual Design workshop. Or, learn more about the design world in our User Experience Design workshops, on campus or online. Takeaways Familiarize yourself with Photoshop, a standard tool in digital design. Describe the fundamentals of digital design. Apply select design fundamentals into a digital design (create a homepage screen using Photoshop). Articulate the current design landscape, including careers and opportunities to learn more about the topic area. Preparation Participants need to have the Photoshop downloaded and ready to go. The full version of Adobe Indesign CC or the free 7-day trial version of it can be found here Download the creative brief and class assets before the class. Participants will be expected to have Photoshop and activity assets downloaded on their computers ahead of time.